Dumb and Dumberer: When Harry Met Lloyd sounded like a bad idea, and the movie removes all doubt. Christian Olsen to mug so hard as Lloyd that he looks like Carrey being demonically possessed by Jerry Lewis. A flat-footed comedy whose best moments are in the outtakes at the end. A dull and dullerer movie likely to make audiences feel numb and numberer. For those who recall the laxative overdose sequence in the original D&D as a comedy classic, there's a gag here about a melted Hershey bar that I thought might make the preview audience soil itself. Bear that in mind. Adults might've felt guilty for liking the first film, but it was hard not to laugh. Adults won't do more than giggle once or twice during the new movie, and they'll walk out feeling dumber than when they walked in. Mostly this movie swings and misses. If you think it's funny, you may just be 'special' too. Believe me, you're better off at home, alphabetizing your old comic books, talking to your parents, or watching paint dry. Feels like the longest movie ever made. In its own dumber and dumberer way, it's an honest and often goofily amusing film. Even dumberer than the original. More moronic than the original. Usually, Hollywood waits until August to empty its cinematic septic tank into multiplexes. This year, the flood has started early. And no movie could be more aptly compared to raw sewage than this film. No Farrelly Brothers, no Carrey, no Daniels... just how dumb do they think we are? The most ill-conceived attempt at extending a franchise since the Pink Panther movie that was stitched together from outtakes after Peter Sellers died. Unfortunately, conspicuous absence of Carrey and Daniels only serves to reinforce new pic's overall resemblance to a down-market, penny-pinched sitcom spin-off (or, worse, direct-to-video follow-up). As prequels go, Dumb and Dumberer: When Harry Met Lloyd is right up there with Star Wars: Episode I - The Phantom Menace -- long, lumbering and endlessly unfunny. The level of humor is, needless to say, idling on level 00 in the parking garage of the mind. While Dumb and Dumber possessed a bracing, genuine vulgarity, this new film is more often merely disgusting as it piles up jokes involving various bodily discharges and the unpleasant things that can be done with them. Director Troy Miller doesn't just lack the comic juice to extend his and co-writer Robert Brener's sketchy ideas into a feature, he's not above selling out his characters for a cheap laugh or two. Dumb and Dumberer: When Harry Meet Lloyd is lame, tame and clearly has no reason to exist except to cash in on the good will created by the original. You can't say you weren't warned when Dumb and Dumberer: When Harry Met Lloyd proves to be a really dumb movie. That's rather the point isn't it? And on the bright side, the movie demonstrates that, occasionally, there is truth in advertising. At 82 minutes it feels longer than Lawrence of Arabia -- and a lot less funny. So excruciatingly awful, the word 'dumb' could sue for slander. I don't know whether it can get any dumberer. 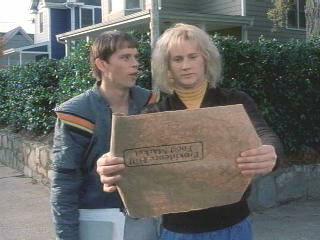 But they definitely put the lame in lamebrain in Dumb & Dumberer: When Harry Met Lloyd. None of the Farrelly brothers' imitators has ever satisfactorily replicated their notorious comedy recipe for genially crude anarchy.